Jaipur strikes its guests with chaotic flamboyance: it is beeping, whistling, grunting, screaming, frying something on the side-lines, trading, making faces, offering to taste the world most delicious yogurt and filling a glass up to the brim with mango juice. All day long it is producing long buzzes and melodic howls, signalling in antediluvian horns, the sound of which resembles an enraged camel, throwing itself under wheels and miraculously turning aside a moment before the collision. Here no one pays attention to the traffic light, cows lie down to rest where they want, and the monkeys arrange gatherings in the midst of the human crowd. An endless flow with a heady brew is chewing, gazing into phones, taking pictures, talking, throwing garbage, scolding children, praying, selling, buying and just staring into the distance smoking flavoured tobacco. Jaipur is stepping on your feet, curiously looking into your eyes in attempt to understand what you expect from it, sometimes it is trying to pull out your wallet or asking you to take a memory picture with it at background. It surprises with its silks, gems, bright lustre of silver, gold and persistently calling to admire the legacy of the Maharajas. The first thing that catches the eyes of a newcomer is the colour of the city. It is pink, although some insist that it has ochre hue. One half of the residents explain it by the fact that the founder of Jaipur Jai Singh II was worshiping goddess Shiva whose favourite colour is pink. 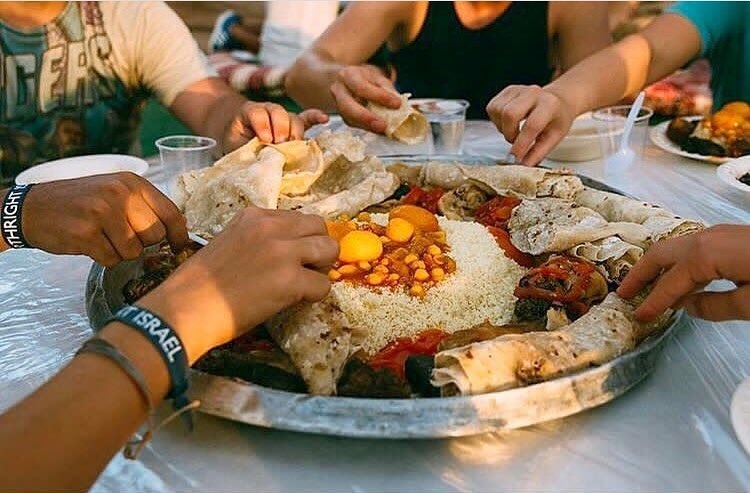 Others argue that it symbolizes hospitality. Using it for decoration buildings in Jaipur, the Hindus wanted to demonstrate this quality in front of the British royal family. However, most likely, the architects had no other alternative: in the city vicinity where building material was taken, there is much pink sandstone used to build most of the walls. 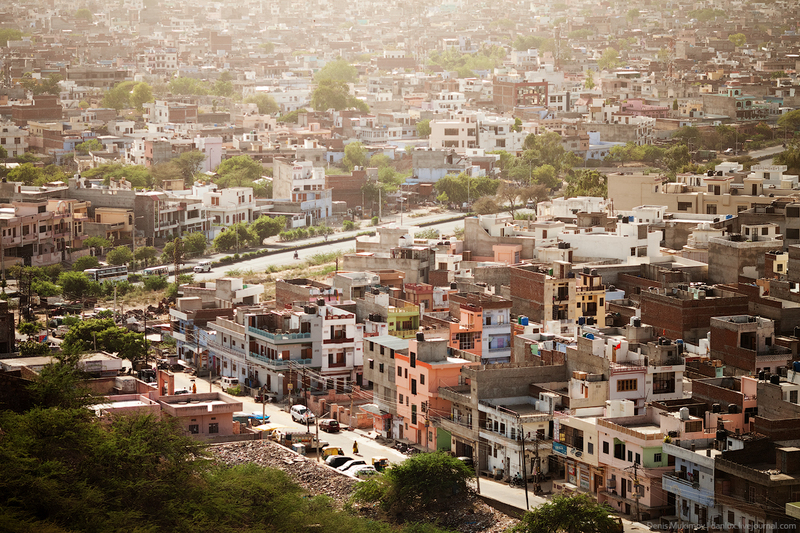 Jaipur, or as it is called "Victorious City" is comparatively young. It was erected in the 18th century by the King Amber Jai Singh II, who decided to exchange the harsh mountains for the mild climate of the neighbouring valleys. From the first days Jaipur set records: in addition to being built for eight years only, city blocks were laid out in squares, and it was quite new for India of those times. The City Palace occupies exactly 1/7 of the entire territory. After the country gained independence from the British Crown, Jaipur became the capital of Rajasthan state. It should be noted that the heirs of the city founder Singh II still live in the chambers of the Maharajas. And they make their living by taking 1/5 of the proceeds from tickets sold to tourists. Jaipur can be admired endlessly. The city is garlanded by the presence of numerous attractions, including an architectural marvel, a five-story, built of pink sandstone Hawa Mahal Palace, also renowned as the Palace of the Winds. Long ago it became a symbol of Rajasthan. So, often in the guidebooks this pink building represents the whole region. Known for exquisite carvings, incredibly elegant, resembling a honeycomb or a laced cloth, it was shaped as the crown of the Hindu god Krishna. The palace was designed for numerous wives and concubines of the Maharaja, so the builders tried their best. Its central wall that overlooks the main street of Jaipur, has 953 small windows, so women could look out and watch the street life. Windows are small to make it nearly impossible to see royal ladies from outside. In addition, those holes in the wall ensure constant ventilation and cool air inside the palace. 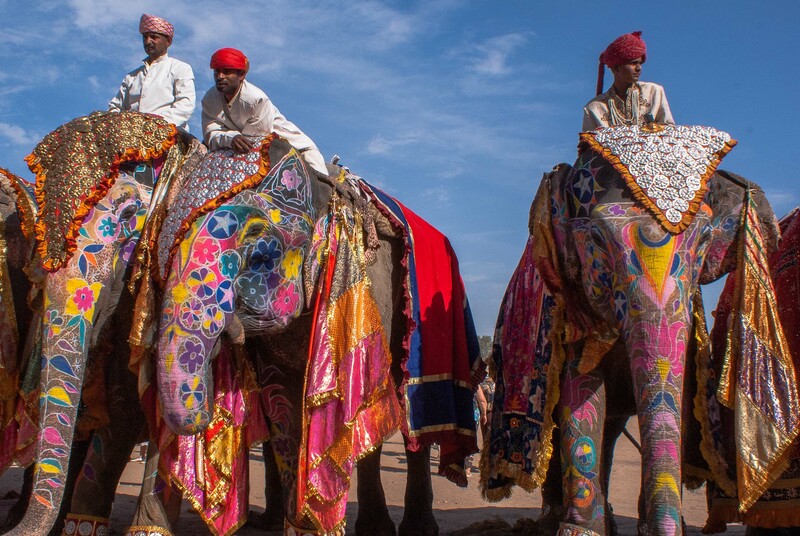 Almost all the tourists coming to Jaipur come to admire this magnificent epitome of love. It is also a meeting point for sweethearts and those who get lost within an ebb of noisy streets. It is particularly crowded near Hawa Mahal Palace in the early morning or evening when palace walls are sparkling in the golden sun rays. Nevertheless, there are tourists that leave the royal place being disappointed. Many expect that such a majestic exterior hides the same bright and unusual chambers of maharaja’s numerous concubines. 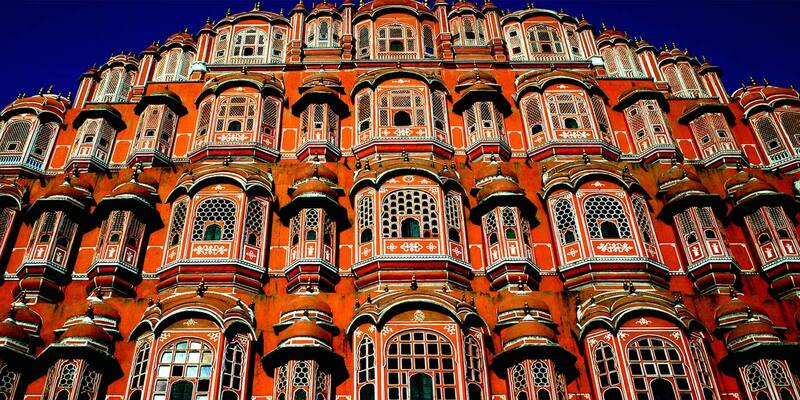 However, Hawa Mahal is more likely a beautiful facade or a wall surrounding a small area. Hawa Mahal is a part of the City Palace, which served several generations of Rajasthan rulers. Now its territory has a museum, where you can admire the ancient clothing, weapons, furniture, household items. Of the latter, two huge jugs cause a special delight. They are listed in the Guinness Book of Records as the largest silverware. However, unusual is not only their size but also the story behind them. In 1902 Maharaja Madho Singh II was going to the coronation of the future King of England, Edward the Second. However, the Indian ruler was afraid to go to such a long journey, as thus he had to live without his usual water from the Ganges River. He was afraid of drinking water from another source, because loss of power and painful death were predicted to him once he gulped from another source. And he found a way out - decided to take water from the Ganges with him. To create jars of incredible size, 57 thousand of silver coins were melted, which blacksmiths reforged into jars. Each contained more than eight thousand gallons of water. It was enough for distant trips, and the ruler of Jaipur after returning lived for many years. Hearing this story, tourists wonder how one can even drink from the Ganges, because it is muddy and does not look like drinking water. However, some of them claim that they have tried to keep it in containers. Initially greenish and non-transparent, after standing for a while, it became crystal clear. Several museums are located in the territory of the City Palace. One of them shows antique weapons: shields, swords, crossbows, swords, skewers, rifles, scimitars, guns, knives, brass knuckles, armour. Among them there are a lot of things amazing for the Europeans. For instance, knives with two blades for hunting tigers, fighting fans, sword to behead criminals. Taking photographs in the museum is prohibited. Women are more encouraged by the Textile Museum. It contains the most beautiful and rich clothes of many generations of Jaipur rulers and royal ladies. It is surprising that some of the dresses weigh more than 15 kilograms each. Women had difficulty wearing them, especially in the seething heat. Therefore, each of them in the palace ceremonies had assistants who literally carried the beauties in her arms.